Yonked :: Diary of a New Home: Furniture Building FRENZY!!!! So Stephanie was gone this past week (in California at a conference and visiting her brother, sister-in-law, and their baby boy B). So I had the house all to myself. Well, almost. 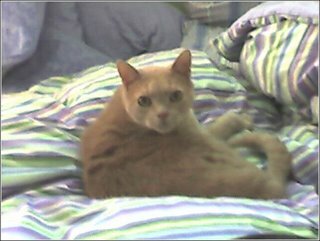 You see there is this cat... Joey... that is Stephanie's best beloved. And not mine so much. We vie for Stephanie's affection. In some ways (and of course this is ridiculous, but it's ridiculous because it's so true-- in some ways he is my rival. The enemy. And now, he and I were alone. Joey and I had a bit of a stand off. He would miaow like crazy and I would shush him. He miaowed more so I fed him. He miaowed some more, and so I petted him. He miaowed some more, so I locked him in the basement. At least I couldn't hear him miaow. Actually, Joey was pretty good for the most part-- except he is constantly underfoot, which presented a little bit of a problem, when I decided that the boxes of furniture that have been sitting in the dining room slowly accumulating stuff on top of them had to go. That's when I went on a FURNITURE BUILDING FRENZY! On one of my trips back from Providence before New Year's, I ended up purchasing these two pieces of furniture on sale at Target. 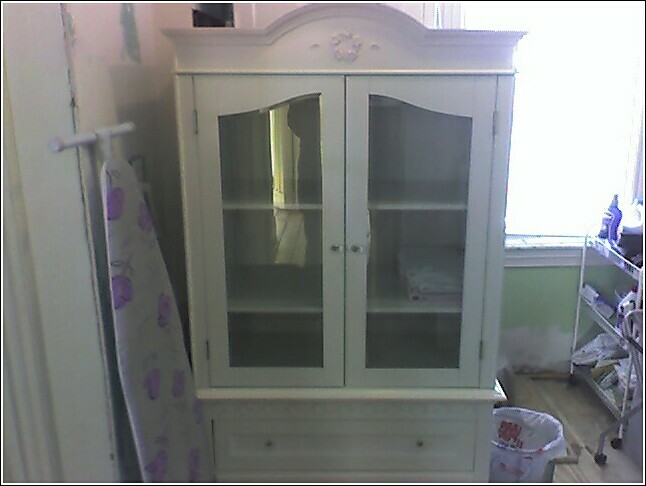 It was the Shabby Chic Armoire and three door chest. Stephanie called me, and said that it was a DIRE imperative that I get these now. So I did, lugging them into the house (these incredibly unwieldy and very heavy boxes that really are supposed to have two people carrying them. They are for our (eventual) master bath, which had lately become a repository of boxes and all sorts of other crap. 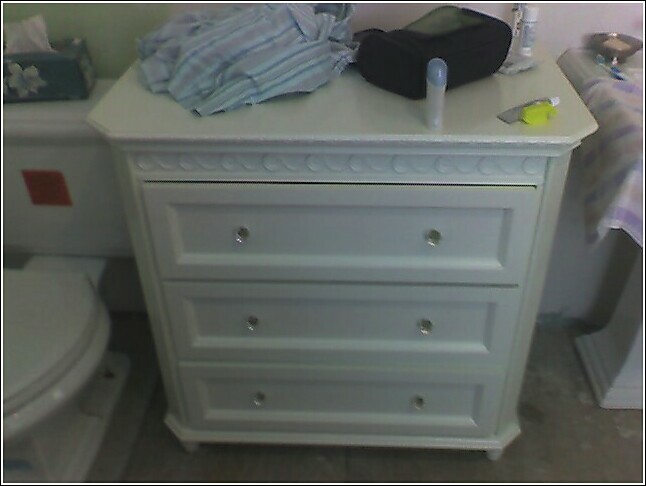 On Saturday, I watched an episode of Clean Sweep, and realized that I had to build these pieces of furniture immediately-- that the boxes in the bathroom could exist NO MORE. So I took these two heavy boxes of Target furniture that we bought, opened them up, transported them piece by piece up the stairs (the boxes were far too heavy and bulky to lift up the stairs by myself) and started building. For the most part they were easy to do-- the directions were all wordless, with very welldrawn pictures. I had a couple of moments where I did the wrong thing, or couldn't quite figure it out, but careful thinking, and a minimal amount of banging my head against a hard surface fixed that. Each of the pieces took me about 4 hours to build. And considering that the armoire had 11 steps, and over 100 screws, that's not that bad. And the fact that I attached the bottom part of the armoire to the top part backwards, and had to redo it. I threw out a bunch of boxes, opened up some other ones, and brought the rest of the crap that had been hiding in that room upstairs to the third floor. Eventually, we'll run out of third floor-- maybe that will be the time to build a fourth floor? The three shelf unit, already with a bunch of Stephanie's stuff obscuring it. Comments on "Furniture Building FRENZY!!!!"